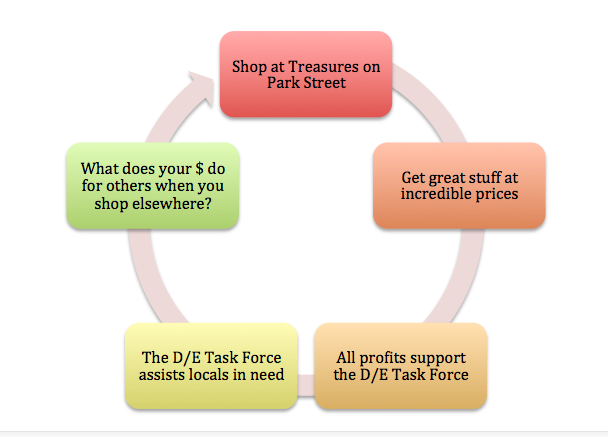 Did you know that simply shopping at Treasures on Park Street is a way for you to help others? When you shop at The Gap, who benefits? Just you and your closet. But not so when you shop at Treasures. Because Treasures on Park Street is in the middle of this great big love story known as the Douglas/Elbert Task Force. You see, every single dollar spent at Treasures goes to support the Task Force. And the Task Force helps locals in need. We get to act as a first responder when locals are hungry, or are about to get kicked out of their house, or have their utilities turned off. The DETF gets to meet those people, talk to them, and help them. Help them make that month’s rent or that month’s utilities. Send them home with 100 pounds of food to tide them over. That’s what the Task Force does. And that’s what your money does. When you spend it at Treasures on Park Street.